Ok let's be honest, Fuchsias are usually grown outside in hanging planters. Because of their brightly colored blooms that hang down looking like explosions of color, they are a must have during the spring and summer months when you want color & beauty. So, it creates a bit of a dilemma when you think about bringing a pot of them indoors. Below are a few tips to help make the transition easier. Start by selecting a nice garden container to plant into. Choose a pot that compliments your indoor decor. Natural terracotta clay is good because these types of planter breathe and help to keep the fuchsia's root system healthier. And, make sure it has a drain hole. Once potted, place the flowerpot in a bright, indirect light. They don't do well in hot intense sunlight. Keep the room cool like between 60 to 70 during the day and few degrees cooler at night. A potted fuchsia won't bloom in temps above 75 degrees. Water regularly during spring & summer, keeping the soil moist but not soggy. Fuchsias are heavy feeder so fertilize on a regular basis. 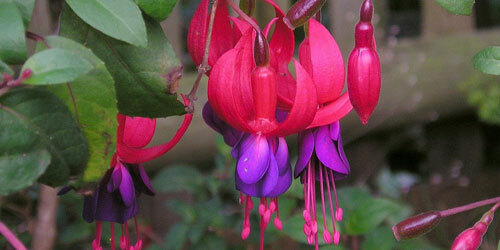 To prepare a fuchsia for winter, decrease the water and stop feeding in autumn. The potted indoor plant may drop its leaves during winter which is normal. You can also trim the plant to 6" in autumn if you prefer. Move the pot into a cool, dark room where temps stay between 45 & 55. Watering lightly 2 or 3 times only. Bring back to room temp in the spring. 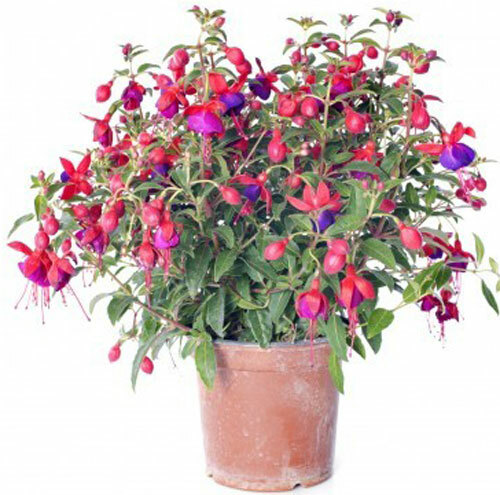 If the fuchsia becomes root bound, then by all means re-pot immediately into a larger container.